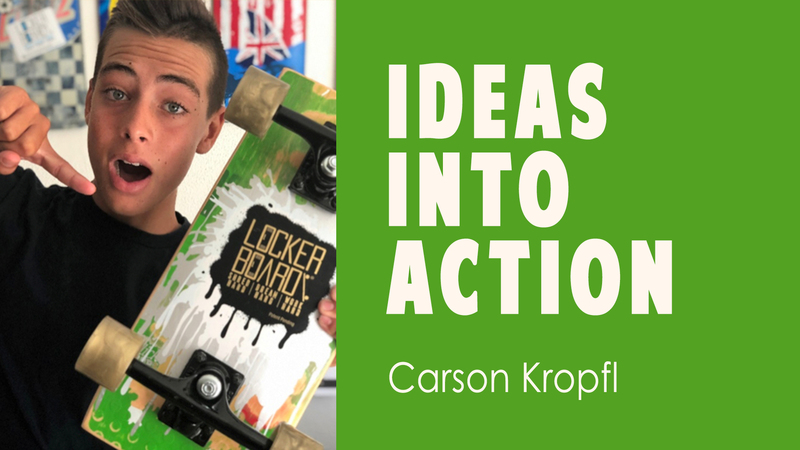 Meet Carson Kropfl, inventor, entrepreneur, business owner and all-around go-getter. You might have caught him on Shark Tank where his ingenious locker-friendly skateboard landed him Sir Richard Branson as an investor. Before you catch him speaking at TED-Ed Weekend (live on youtube.com/tededstudenttalks), check out this Q&A. Hi Carson! What inspired you to develop your product? In 2016 I started middle school. It was the first time I ever had a locker. I was really excited about it. I wanted to ride my skateboard to school and put it in my backpack and locker. I live in Southern California and our lockers are small. None of my skateboards would fit in my backpack or locker, not even my Penny Board. So, I decided to make one that could fit inside. At first, I made one for myself and all the kids really liked it and wanted to try riding it. Then my parents told me that I had to clean and do chores to pay for my surf contests and surf lessons. I HATE to clean, so I asked them if I could try selling my Locker Boards instead. It turns out that I created the first non-folding skateboard on the market that can fit inside of a backpack. It’s awesome. I take my Locker Board everywhere and just slip it in my backpack when I’m done. They are great for school and traveling. Developing, manufacturing, marketing and selling a product takes time, and I’m sure it involves a lot of false starts. During that long haul, how much were you motivated by inspiration versus discipline? It was more inspiration for me. I was inspired to start selling Locker Boards to get out of having to clean! When I started I didn’t have any money to advertise. I used social media to spread the word. This is still a main source of advertising for me. With social media, you’re only limited by your imagination. This is the first video I ever posted. I had 300 followers the day after I posted this and realized I was on to something. That inspired me too. I liked that people were interested, and it inspired me to start selling my Locker Boards at school. At first, I only sold decks (without trucks and wheels). I would take five decks at a time in my backpack at school and sell them for $20 each. I quickly sold out and that inspired me to make more. After 6 months of business I had handmade about 400 boards myself. I hired some part time employees to help me, but I was starting to get burned out. Then, the executive producer of Shark Tank called and asked me to apply for the show. This inspired me to keep going. Over 40,000 people applied for the show and they called me and asked me to be on it. I realized I was having an impact. It’s funny. Every time something gets really hard and I want to give up, something good happens and it inspires me to keep going. There have been a lot of lessons along the way. It’s hard work. Over the long haul it has been inspiration that has kept me going. My favorite part of this whole experience has been the awesome people I’ve met along the way. When someone comes up to me and tells me that I’ve inspired them to go after their dreams, or they tell me how much they love their Locker Board…that inspires me to keep going. And do you have any tricks for keeping yourself inspired and/or for staying focused and disciplined? Yes. A couple of things. First of all, I pray for help and inspiration all the time. If you pray, meditate or like to be in nature to have a spiritual connection I think that is a really important part of helping you stay inspired and on the right path. 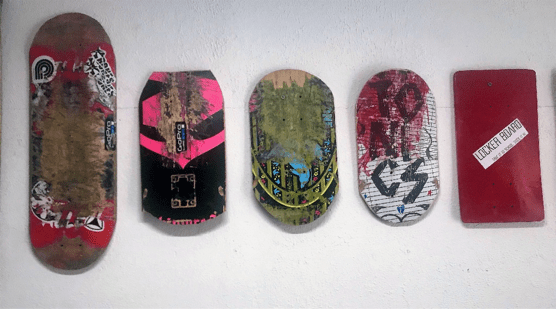 For example, when I started my business (before Shark Tank) I collected used skateboard decks from skate shops to make my Locker Board decks (when kids buys new skateboard decks they leave their old ones behind). It was a lot of work. I would typically get 2-5 skate decks at a time. I needed a lot of skate decks and was getting burned out driving all over Southern California trying to hunt them down. I sent a DM to Vans on Instagram about what I was doing. They sent me a DM back asking me if I could actually do a trick on my Locker Board, so I posted this video. They invited me to their corporate headquarters and I met with Steve Van Doren (his Dad started Vans). He set up a recycling program for me at two of their skateparks and I started getting 50-100 recycled decks a month. What were the very first steps you took on your path to creating Lockerboard? The first thing I did was create a prototype. It took me five tries to get it right. The first deck I made was too big, because I didn’t measure my locker. I guessed at its size. I learned a valuable lesson about measuring. The next few decks I made, I tried to shape like a traditional skateboard. They didn’t work because the small size made them unstable and I would flip off. I got super frustrated and almost gave up. But, then I thought what if I squared off the edges so I had more room for my feet? It worked! Here’s a picture of my prototypes. My parents played a huge role. We had a small outdoor shop in our backyard. My Dad and I always did a lot of projects together around the house, so I knew how to use the tools. But the saw that we had was a table saw and my Mom was freaking out. She was worried I was going to cut my arm off. So my Dad bought me a chop saw with a plastic protective shield that would go over the blade when I cut my boards. They had to drive me around to all of the skate shops to collect decks. They helped me a lot. Here’s a video that shows how I use to make the boards (after Shark Tank I hired a manufacturer to do this for me). They showed me how to write a business plan so that I would be organized with my goals. That really helped me. It taught me what you have to think through to start a business. It helped me stay focused. The reporter grabbed his tape recorder and immediately started interviewing me. They came to our house and took pictures. The article got picked up nationally and a website that teachers use in classrooms across America, Newsla.com, turned the article into a lesson plan. Here’s a link to it. Kids from all of the US started contacting me and telling me they had to do homework about me. Everyone wanted to buy my boards, so my Mom helped me create a website and we started selling them online. Did you ever feel stuck? Where did that feeling come from for you? Are there any specific steps you took to help yourself feel unstuck? When you need help, who do you turn to? I’m new to all of this, and learning along the way. I’ve surrounded myself with mentors. When I meet someone that I connect with, I keep in touch with them. In 2017, I was invited to Nike Headquarters to be mentored for two days by Nike executives. I belong to a group of young entrepreneurs called Independentyouth.org and they organized the trip. While I was there I met the Lead of Sustainable Innovation, Noah Murphy-Reinhertz. He really liked my Locker Boards because they were sustainable. We had a connection. I asked if we could keep in touch. Then, I followed up. I sent him a Locker Board and thank you note. I emailed him. When I got stuck or had an idea I called him. Now we are collaborating on new ideas together! Here’s a video Noah made for me. He’s one of the coolest guys I know. Do you have any advice for young would-be entrepreneurs? What is the most valuable advice you’ve received on your journey so far? I met the executive producer of Shark Tank, Max Swedlow, when I was seven years old. I had another product I had made when I was seven called Streetubez. 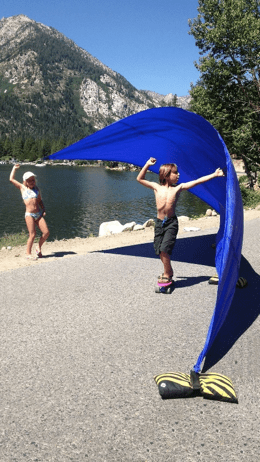 It’s a skateboard accessory that gives riders the experience of surfing and getting tubed. Here’s a video of it to show you how it works. My parents helped me make a prototype for it and we took it with us on a family vacation in the mountains so I would have something to play with. They took a bunch of pictures of me playing with it. Then one morning, we were in the elevator of our hotel going to breakfast and a man walked into the elevator wearing a sweatshirt with a Shark Tank logo on it. My Dad asked him if he had been on the show, but he said he was the executive producer of the show. I LOVE Shark Tank so I grabbed my Mom’s phone and started showing him the pictures of Streetubez we just took. I gave him an elevator pitch. This is one of the pictures we showed him. He liked the idea, but told me my company was too small for Shark Tank. He gave me his contact information and told me to keep in touch. For four years, every 6 months I would update Max about what I was doing. When he found out about Locker Board he called me and said I was ready for Shark Tank. What are the chances of that happening? When you have an opportunity like that you have to seize the moment or you may never get that chance again. If I hadn’t manned up and given Max that elevator pitch none of this would have happened. Not only do you seize the moment, but you never give up. During those four years I kept working towards my goal, despite facing some serious obstacles. The final thing is to believe in yourself. When I was on Shark Tank three sharks fought to invest in my company (Mark Cuban, Robert Herjavec and Sir Richard Branson). I chose Sir Richard Branson because we had a connection. He told me that I reminded him of himself when he first started his company. People don’t just invest in your business, they also invest in you. If you don’t believe in yourself, no one else will. With Sir Richard’s help I now have the top manufacturers in the skateboard industry making my sustainable line of Locker Board skateboards, my company has grown 300% and I just launched on Amazon. I now sell three types of Locker Board skateboards. Here’s a video of my new Locker Board product line. Dreams really do come true if you seize the moment, never give up and believe in yourself. If I can do it, you can do it. Shred Hard. Dream Hard. Work Hard.